I've been working on a performance monitor library for some time. While I'm implementing the looper-monitor feature, I found it's necessary to get clear on the Android message handling mechanism. In this article, I'll write about the relationship of Looper, Handler and Message. As it's just a memo for me, I'm not gonna write in every detail. I write a rough draft to demonstrate how they interact with each other. Take the main thread for example, the real entry point of an application is ActivityThread.main(String args), so I'll start with this method. ActivityThread init a looper and run into message loop. Looper.prepareMainLooper() is a wrapper method for Looper.prepare(boolean quitAllowed), it init a Looper instance, note that this instance is a thread-local value. Looper.loop() takes messages from message queue repeatedly, and dispatch them to their target. The Message.target is a Handler, this field gets its value when we call Handler.sendMessage(Message msg). When we call this method, it eventually get here. A Handler instance holds references to a looper and the looper's message queue. 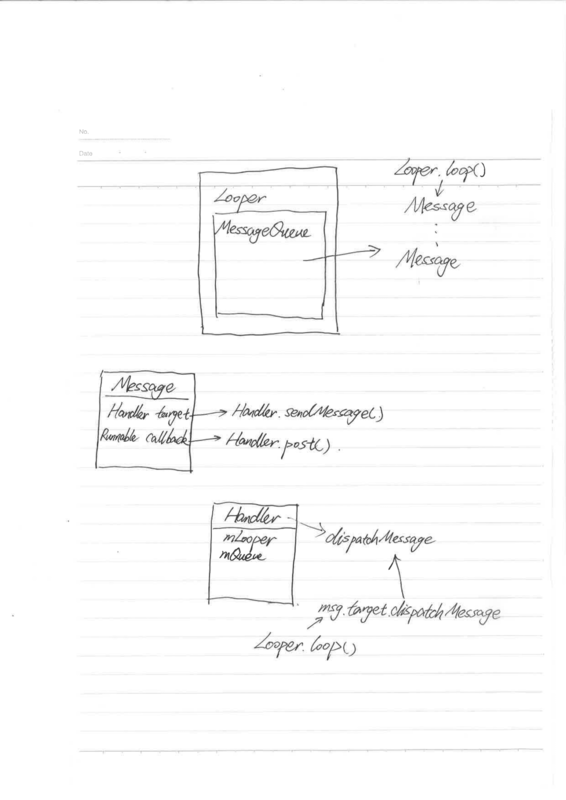 When we send a message with a handler, in fact we inject the message to the looper's message queue associated with the handler. When Looper.loop() take the message out, this message will be handled by Handler.dispatchMessage(Message msg). That's why we have to implement the Callback interface or override Handler.handleMessage(Message msg) method to handle the message. Message.callback field is a Runnable instance. When we call Handler.post(Runnable r), the Runnable instance is assigned to Message.callback, and gets handled by Handler.handleCallback(Message message). By the way, life cycle of Android application is also based on Handler. An inner class ActivityThread.H receives message from AMS and call Activity's life cycle callback accordingly.